I don’t know much about celebrities, much less about celebrity couples. Despite having good friends who are very much in the know (one in particular comes to mind) I remain, blithely, and blissfully, unaware. I’ll take my own little (unglamorous) world of weekend markets, chocolate cupcakes, and the occasional sliced/burned finger, thank you very much. This world also comes with irrepressible toddler giggles, the beatific smell of infant feeties, serious contemplation on princess dress attire, and more such commonplace occurrences. Don’t be misled though, this world also includes the tribulations of emergency laundry runs, messy rooms, too much carbs, and the occasional tantrum. Thankfully, there is also family, friends, and lots of gin and tonics! In short, plain, regular, wonderful, everyday, exhilarating, real, life. Just that. Nothing more, nothing less. But it’s all mine and I couldn’t be more thankful. Perhaps this sounds familiar to you too? Anyway. Celebrity couples. I’m not the expert and I don’t really try to be. But I must confess I have a few favorites. Right there on the top (next to Jamie and Jools) is the Barefoot Contessa and her beloved Jeffrey. Despite technically living a life some would consider as glamorous (living in East Hampton, Manhattan, and Paris!) she manages to make it seem just as cozily and marvellously ordinary as yours or mine. And how she adores her Jeffrey, makes him drinks when he gets home and romantic dinners outdoors on the grounds of their beautiful Hamptons residence. But what it, always, all boils down to is simple but great food, made with care, and served with love. Something we all can do…whether we have a house in the Hamptons or not. I’ll own up to being an absolute sap. But you’ll thank me when you taste this marmalade. – Cut the oranges in half crosswise and then into half moon slices. You can do this very thinly for thin-cut marmalade or as thickly as you want for a chunkier version (the original specified very thin slices). If you opt for the thick route, cut each half moon into two. Discard any seeds. – Place the sliced oranges and all the juices into a stainless steel pot. Add the 4 cups water and bring to a boil, stirring occasionally. Remove from the heat and stir in the sugar until it dissolves. Cover and leave overnight at room temperature. – The next day, bring the mixture back up to the boil. Reduce the heat to low a simmer, uncovered, for about two hours, stirring occasionally. Turn up the heat to medium and boil gently, stirring more often, for another 20-30 minutes. Skim off any foam that forms on top. Cook the marmalade until it reaches 220F (you can also test for readiness by placing a plate in the freezer and putting a small amount of marmalade on it, return to freezer, and then poke it with your finger – if it is firm and ripples slightly when poked it is done – if the marmalade is too runny cook it for longer, if too hard then add water). 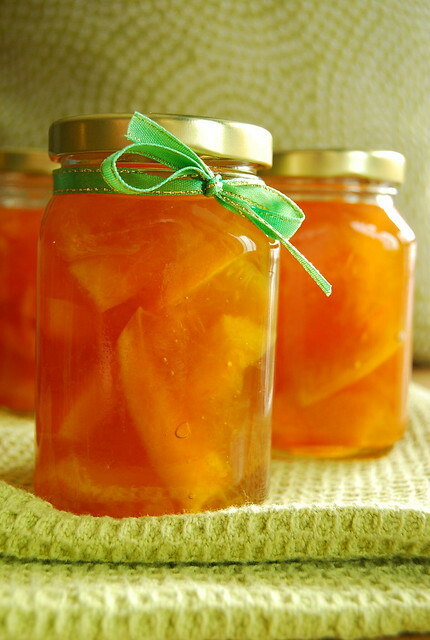 – Pour the hot marmalade into sterilised jars and seal. Flipped the sealed jars upside down and let them cool completely before turning right-side-up again. You can of course use your own method of sterilising. This is adapted and I have yet to try the original…so keep in mind that this may not even be its best incarnation. Ina’s original recipe includes lemons as well as oranges, so just imagine! Also, I reduced the recipe in half as I am not yet at that domestic wonder-goddess level of making big-batch preserves and “putting up”. My half recipe made 3 regular jam jars (pictured here) and a bit leftover for the refrigerator. Which is perfect for me – some for myself and a couple of jars to gift to friends (one of these went to my best friend K who loves marmalade). It also needs to be said that I didn’t follow instructions closely and did not (or could not) slice my oranges as thin as Ina’s, which made for a more thick-cut marmalade. Perhaps next time I’ll finally spring for that mandolin! I’ll also confess that what attracted me to this recipe was its simplicity. A lot of marmalade recipes involve multiple sets, what with separating the seeds, putting them in a cheesecloth bag, and whatnot. This one is absolutely bare-bones. Perfect for busy bees and newbie preservers alike. And although it calls for an overnight rest, it actually has very little active time. So, to Ina and Jeffrey, to C who is the Jeffrey to my Ina, to K with whom my heavy handed orange rind slices went much appreciated, and to every barefoot contessa out there…this one’s for you! It looks fabulous and must taste heavenly! It sure does look fantastic and I have to confess I don't know that much about the barefoot contessa… I do know I love Jamie and Jools, so many that alone should be a reason to check out the barefoot contessa. This marmalade sure looks good enough! I love Ina Garten! I don't know if you can have pregnancy cravings on someone, but when I was pregnant with my little girl, the highest point of my day was when the episode of Barefoot Contessa was playing. Hehehehe! 🙂 She's the best! Oh this would be terrific on a large slab of thick toast! I love your orange marmalade recipe. It reminds me of one my dear old Aunt taught me (though yours is quicker to do). Bookmarked this and will try soon. Thanks for sharing and hope all is well, J! oh, i absolutely love this post, Joey! I just came by your blog and think it is great to read! I actually also have a foodblog on blogspot and I hope you'll check it out too! The language is in English and there are a lot of delicious recipes! Italian meatballs, sorbet, rich chocolate tart and much more! I hope you will stop by! i just made this using your half recipe since I don't actually know if I would like orange marmalade. I have to say that now I know I like it, it set up perfectly and had no problems whatsoever.